Product #60659 | SKU 6-335 | 0.0 (no ratings yet) Thanks for your rating! Charge up to four batteries simultaneously with the Cinegears V-Mount Quad-Charger Power Station. 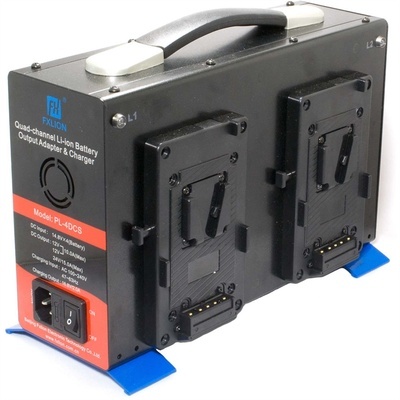 The Cinegears 14 VDC Quad-Charger Power Station with Discharger (V-Mount) can charge up to four batteries simultaneously. Switch the unit to DC output mode to use its two DC outputs. It's perfect for LED light panels or long-term camera power. This unit features power surge protection, under and over charge and discharge protection, and is internally cooled with a powerful-yet-quiet fan. Keep an eye on charging status with separate indicators for each battery. This unit is lightweight yet robust, featuring a solid handle for easy portability.